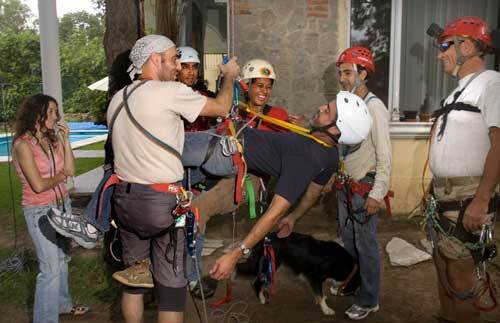 Fifteen cave explorers from various parts of western Mexico gathered in Zapopan August 14-16, 2009, to learn and practice techniques for rescuing an unconscious comrade hanging from a rope inside a pit. 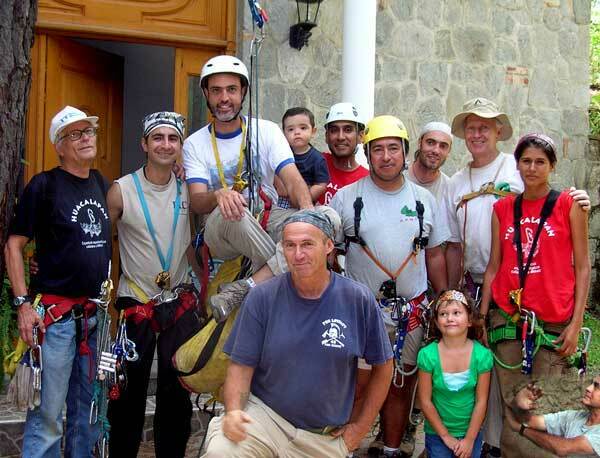 This first Zotz Rescue Workshop was held at the home of Canadian geologist Chris Lloyd in Pinar de la Venta, at the northern edge of the Primavera Forest, and was led by speleologist Sergi Gómez of Catalonia. 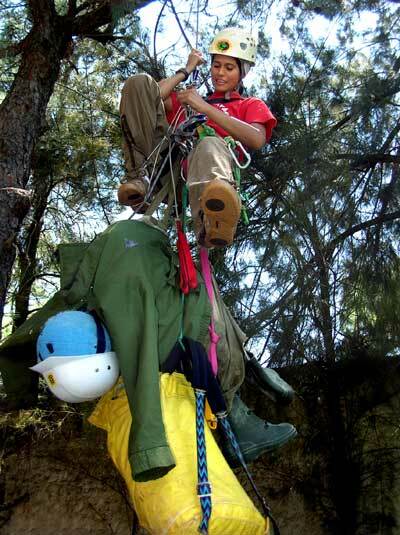 In this workshop, the challenge was to master techniques that would not require any more equipment than the normal gear cavers carry for SRT. Death from this syndrome comes about because mountaineering harnesses are designed for people who are moving and most of them interfere with the blood circulation and breathing of an immobile subject hanging in the air. 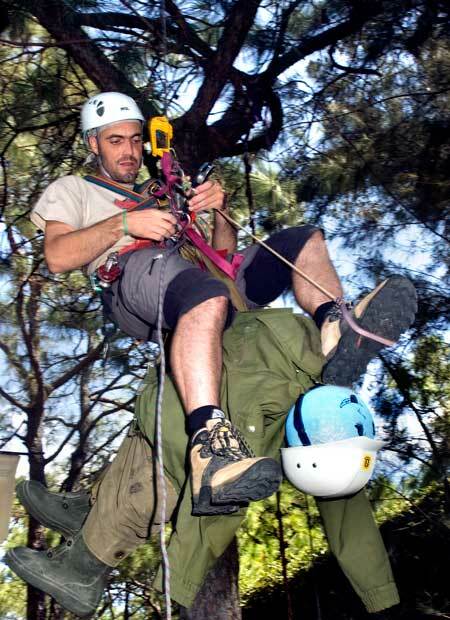 One main focus of the workshop was “picking off” the hurt caver, approaching him or her both from below and from above. 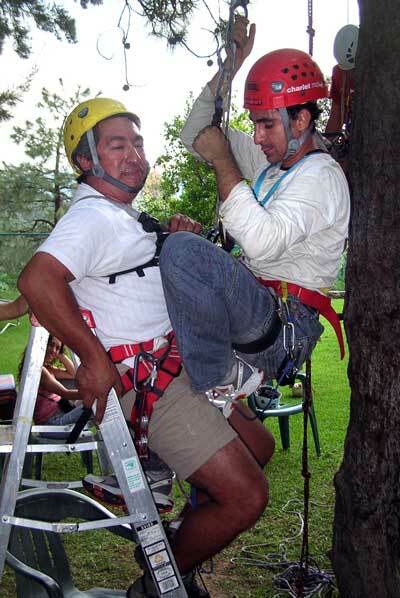 The aim here is to bring the victim down to the floor of the cave as fast as possible, to prevent Harness Syndrome and to allow first aid to be administered. After that, the victim can be strapped into a litter and safely hauled up and out of the cave. Diagnoses on what to do next are offered by all, as the victim patiently "stands by." Systems to accomplish this included The Catalan (maybe French?) Knee Lift as demonstrated by Sergi as well as the use of a simple mini-Z-pulley rig. 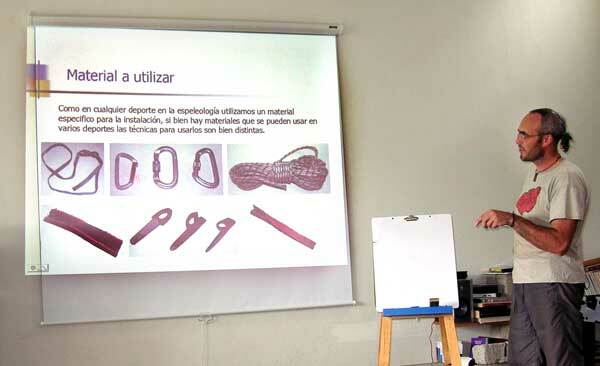 In addition, some cavers tried out an approach described by Matt Oliphant, in which the victim is attached to the rescuer by a cows tail and lifted by small steps until his or her Croll can be disconnected. An advantage of this latter approach is that either a rack or a Stop can be used for the descent. 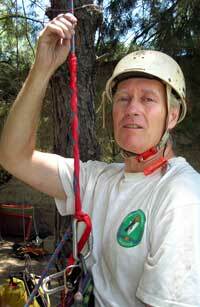 Chris demonstrates emergency descender whose speed can be controlled with a touch to the top of the wrap. Thus, Sergi showed a special way to load a Stop under these circumstances and John Pint tried his darnedest to figure a way to get a rack on that tight rope. 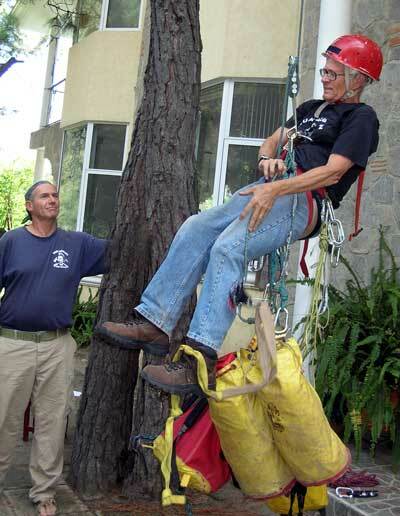 These attempts to use a descending device on the loaded rope were not considered 100% safe by everyone and it could be that simply “jumaring down” (for those who still remember what Jumars are) might be the safest way to reach a victim who is not too far below the rope anchor. "Gimme a break!" Having discovered exactly what it feels like to be a victim in Jorge's seemingly endless rescue, Chava takes time out for a breather. Before experimenting on volunteer “victims,” the workshop participants practiced rescuing Baggy Bill, a heavy sack filled with rope, but by the end of the event, all of them had played the role of both victims and rescuers and had plenty of bruises and sore muscles to show for their efforts. “OK, OK, Chris,” said Sergi at the end, “We practiced picking-off all weekend, so now can we finally go to that humongously deep pit you found in Manantlán? Can you guess where Zotz is heading next? "No, no, guys, you got it all wrong! Sergi's video says..., Chin! I wish it wasn't all in Catalan!" Too bad you can't do a computer check during a real rescue. "See? You can use a rack too!" says John after rescuing 4000 kilos of rope. Rocio saves Baggy Bill for the 700th time. "Hey, I think I'm starting to get the hang of it." 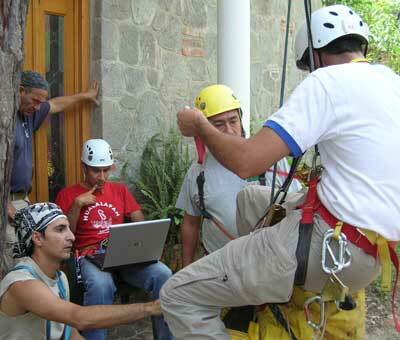 The Rescuers. From the left: John, Jorge, Beto, Little Alberto, Hugo, Chava, Sergi, Chris, Rocio. In front: Big Mitch, Little Meli and that creature down in the corner trying to crawl into the picture is Luis "Dracula" Rojas.